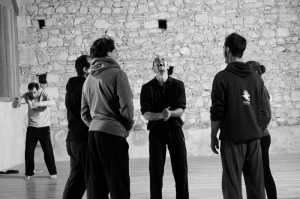 OBRA is an international theatre company based in southern France. OBRA make theatre rooted in the relationship between language and the physical life of the performer, adapting texts not originally destined for the stage to create innovative theatre for modern audiences. OBRA’s practice combines technical craftsmanship with psychophysical practice and heightened language. The company work in a Laboratory theatre model, creating through intensive research and investigation to develop their practice and generate a new approach to performance according to the needs of each text. OBRA seek an embodied performance state; the interaction of intellect, instinct and imagination in the performer, to facilitate a revelation of meaning through language. OBRA functions with a central artistic team and a group of associated artists who are invited to collaborate on specific projects. OBRA’s performances are at once simple in staging and design, and complex in layers of image and meaning. The company combines an irreverent sense of humour with finely wrought dramaturgy, relying fundamentally upon the performer’s body as the main scenic element in combination with music and lighting. Alongside performance projects, OBRA continue to develop their practice in the form of open research sessions in collaboration with invited artists, for professional participants; these residencies investigate particular texts and new areas of practice. The company members also lead workshops in their specific actor training for professionals, students and youth at their base in France. The company are regularly solicited to work with students in the UK, France and across Europe; to lead work at youth theatre festivals, international school exchanges and university masterclasses. OBRA are funded by multiple sources, both public and private in the UK and France; Arts Council England, DRAC Occitanie, Region Occitanie, Gers department, Pauilhac council and Private philanthropy. OBRA is the company in residence at the Au Brana Centre in Southern France, a space which they have built and which is dedicated to the exchange of performance practice and the support of emerging artists (www.aubrana.com). Founded in 2006 the company earned its name as its members converted the 300-year-old barn into an ideal rehearsal and residential space. Striking the balance between the artistic aims, continuing construction work and administrative roles required for this endeavour inspires and cements OBRA’s practical approach to creativity.